Everyone collects in their own way, but that word “true” adds a certain qualifier that not everyone can meet. Perhaps to you it’s similar to a super collector. Maybe their collection is vast and sprawls throughout the entire basement. Maybe they have some crazy unique items that no one else would think to have. Whatever your definition, my guess is that the man known as sruchris meets it. Take a look at that link and see what he collects and then tell me he doesn’t fit the mold. If you follow the guy on twitter, you’d see his passion pretty quickly. You’d also notice his knowledge is quite impressive. 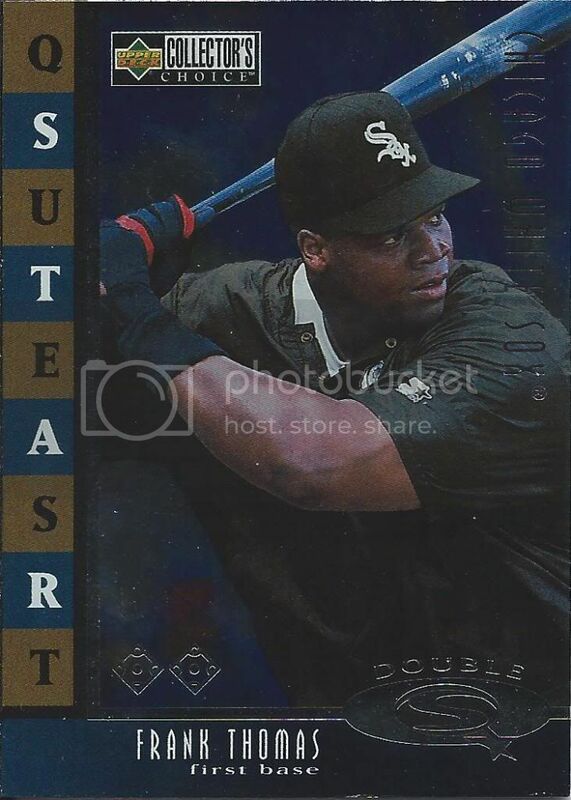 Would you really expect anything less from the guy who, along with Stale Gum, started and maintains the invaluable resource BaseballCardPedia? As if you couldn’t guess by now, this true collector and I worked out a pretty sizeable trade recently. 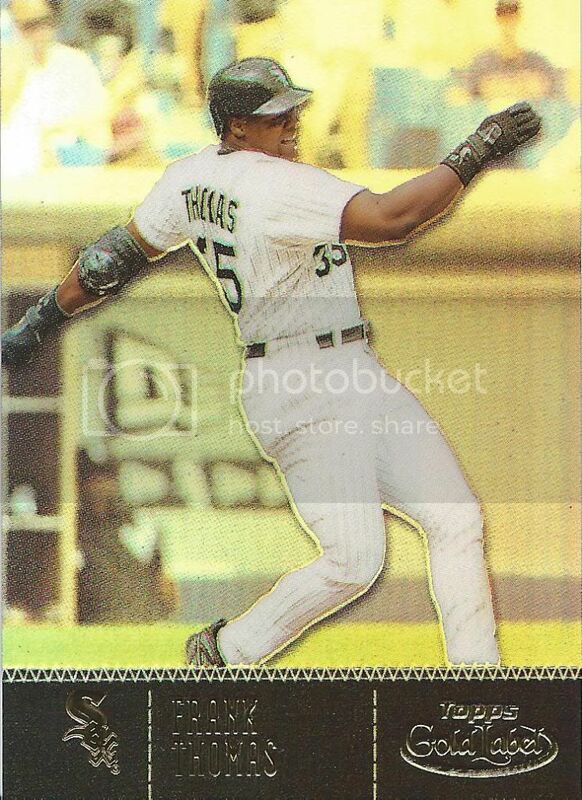 He’s attempting the near impossible task of collecting the entire 1999 Topps Tek set. Every card. Every variation. What I’m saying is trade the guy some Tek for crying out loud! 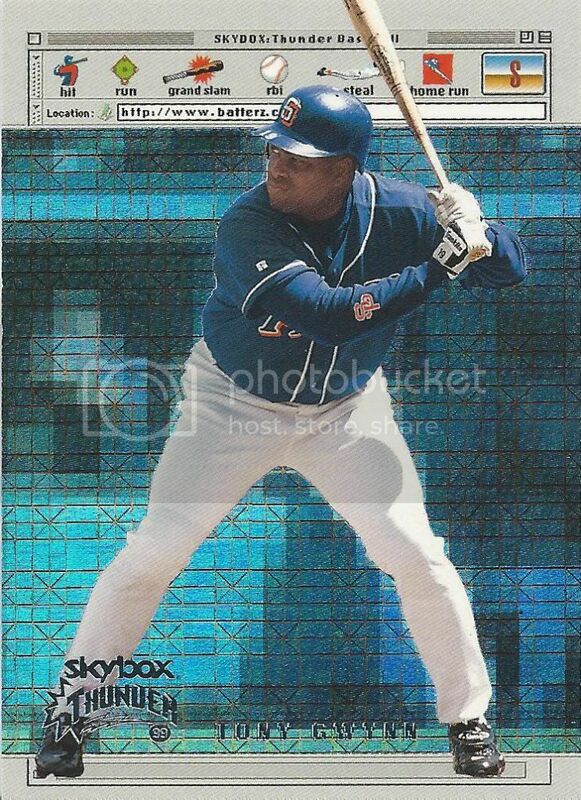 I happened to have bought a box of 1999 Tek as a bonus incentive for a group break. It turns out the bonus wasn’t met, so I ripped it for my own. Your collective loss is my collecting gain as I sent him nearly the whole box worth and he sent me a random surprise assortment from his vast archives. 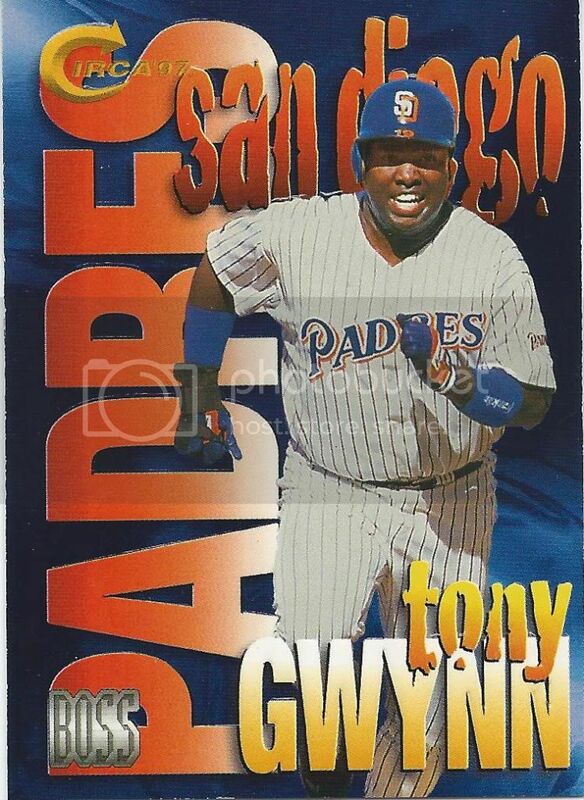 I don’t know if I’d call the Padres one of the finest franchises, but Tony Gwynn certainly was the franchise player. 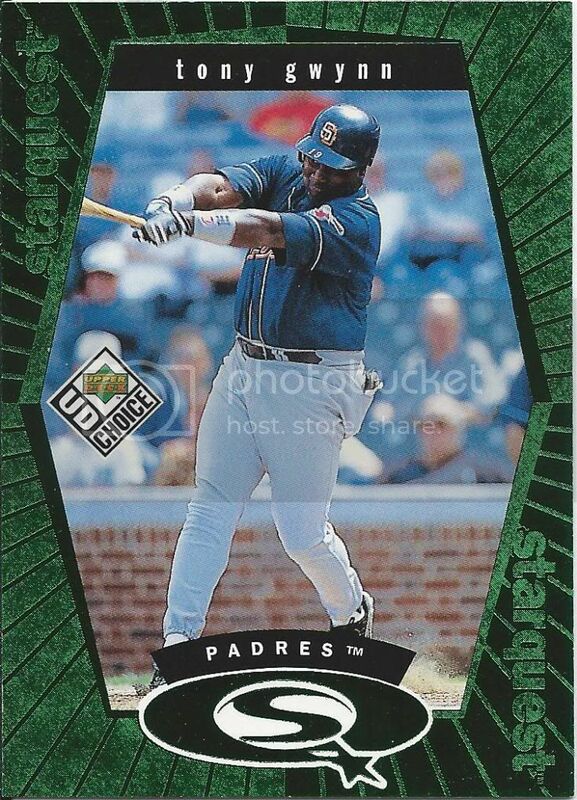 Would you expect less from someone with the nickname Mr. Padre? 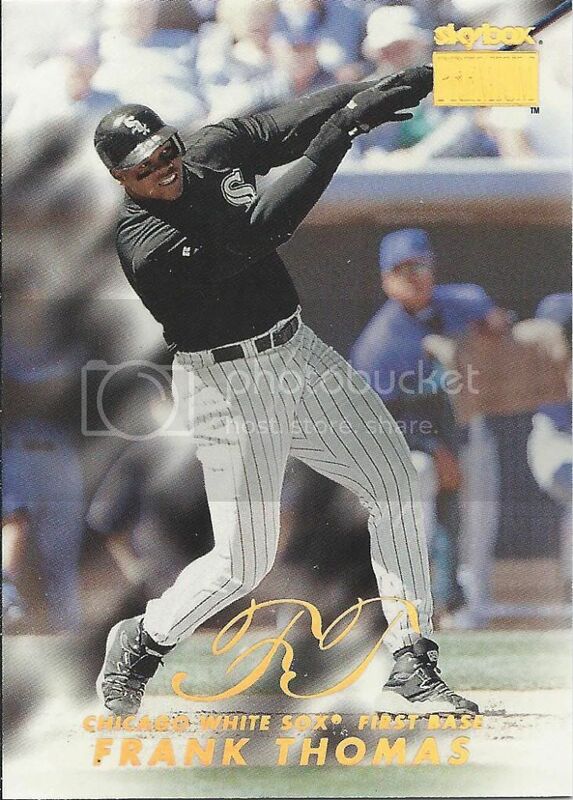 Oh, and as a teaser for everyone reading, I have two boxes of 1996 Finest (among others) sitting in my apartment right now for a future group break. I’m going to use them to celebrate me moving into a new house. That might be a few weeks down the line, so stay tuned for more details. Ouch! I think I burned my hand. AND stabbed my finger! Collecting is dangerous. Run, Tony, RUN! The fonts are attacking. Don’t look back. You’ll be okay if you keep running. Some of them are already falling apart. Just a little further and you can duck into the Rave. If you were wondering, the bigleaguers address still works. It now re-directs to the MLB Players website. 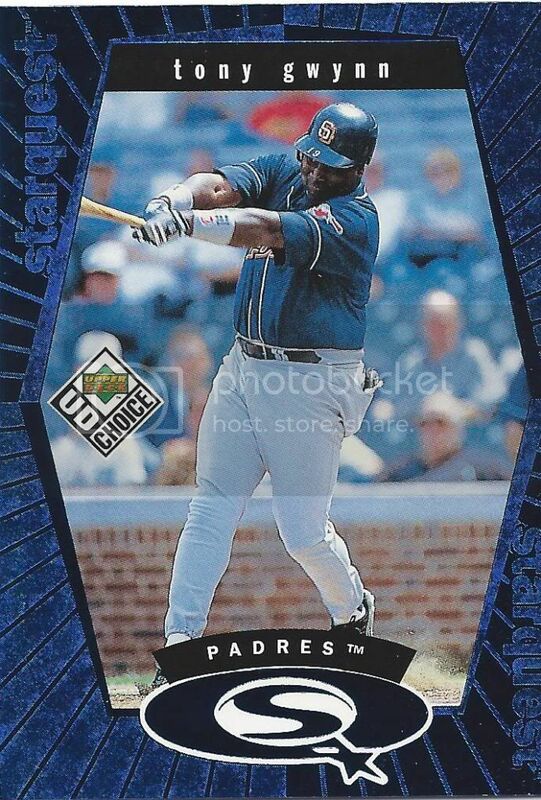 I don’t know if the Padres address is a mistake or not. The dot org leads to some weird blog with random sports articles. 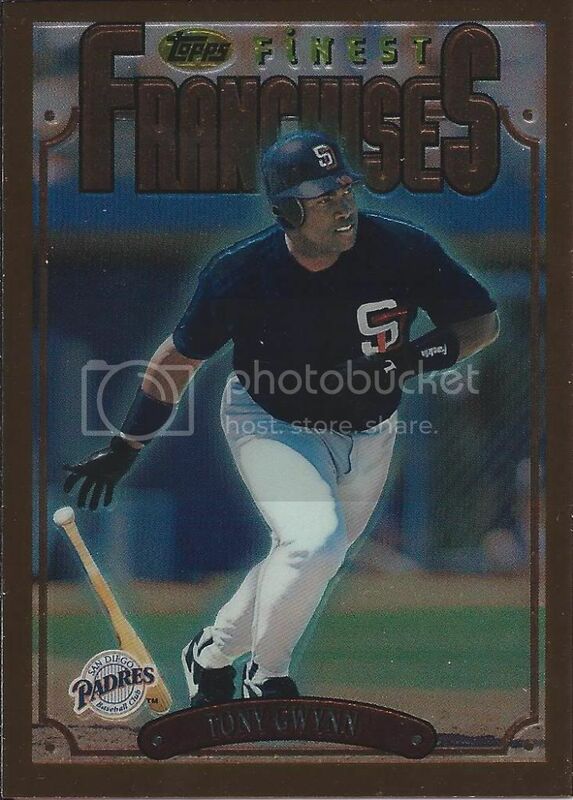 Back when this card was created, it’s certainly possible the Padres organization didn’t have their own dot com. The Brilliants card is much more brilliant in person. I think my favorite part is the font. It’s reminiscent of a middle ages typeset. I don’t know if it fits the theme, but I also don’t know if there really is a theme. Skybox for basketball worked well, because they could put their effects trail on the ball. As we’re seeing in baseball, the ball isn’t always in frame, so they put a weird trail around the entire player. If it were me, I would have only made the bat glow. Don't you feel old now? I remember when the internet was first starting out. I saw a commercial for M&M’s that advertised their website at the end and I wondered “Why would M&M’s need a website? Who would buy M&M’s online?” Now it’s weird if any company doesn’t have a web presence. 1997 was a simpler time. Two years later and we still see what companies thought cyber stuff meant. The only thing missing is the “under construction” .jpg. I used to love Collector’s Choice. I really believe it gave me some of the best bang for my collecting buck. StarQuest changed my perception. I don’t think the truly low-end should have high-odds chase items. 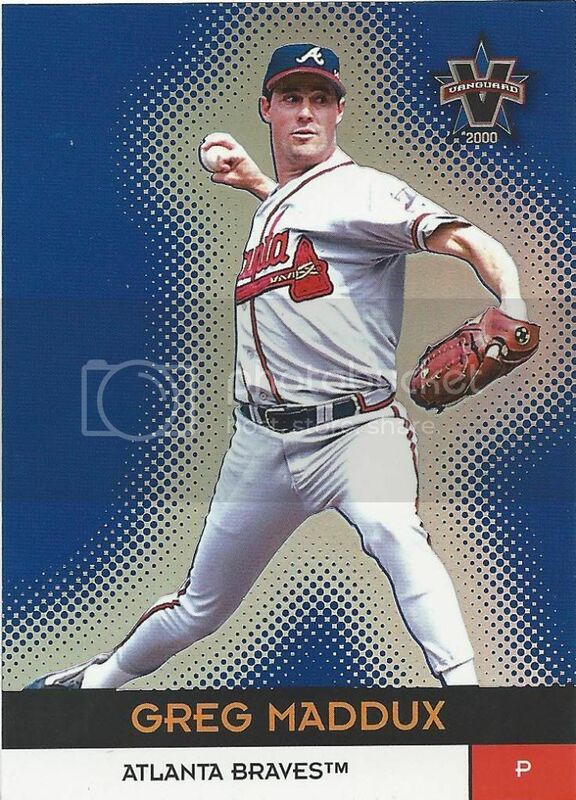 I’m not happy about chasing several different tiers of an insert, especially when the toughest to find is /100. Back when that really meant something. Actually it still means something. I like this concept. Take a stat and show how you calculate it. 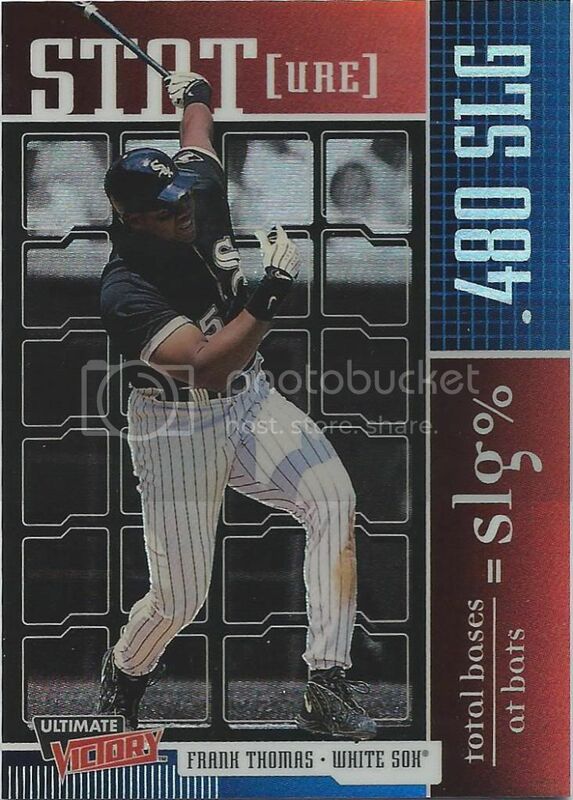 I think this day and age of advanced stats would be perfect for a revival of this insert set. 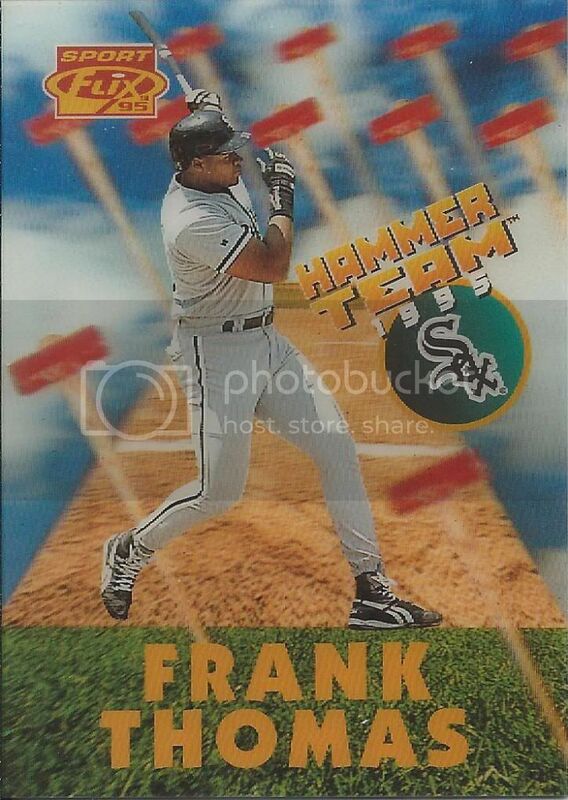 I’d say 3,000 Hits would qualify for the Finest moniker. 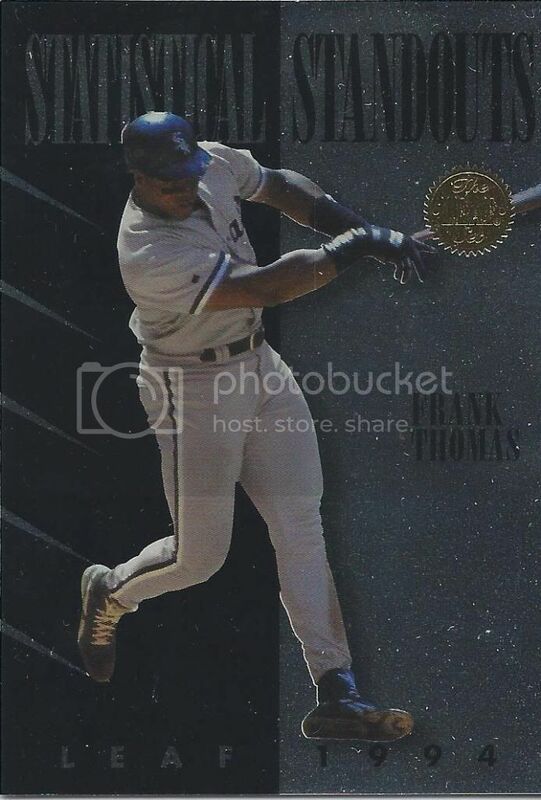 Boy, good thing he didn’t reach that during one of the years Topps put out Moments & Milestones. And here’s the skybox version. I know which one I like better and I didn’t show it last. The picture is better here, but the “highlights” on the background need to go. 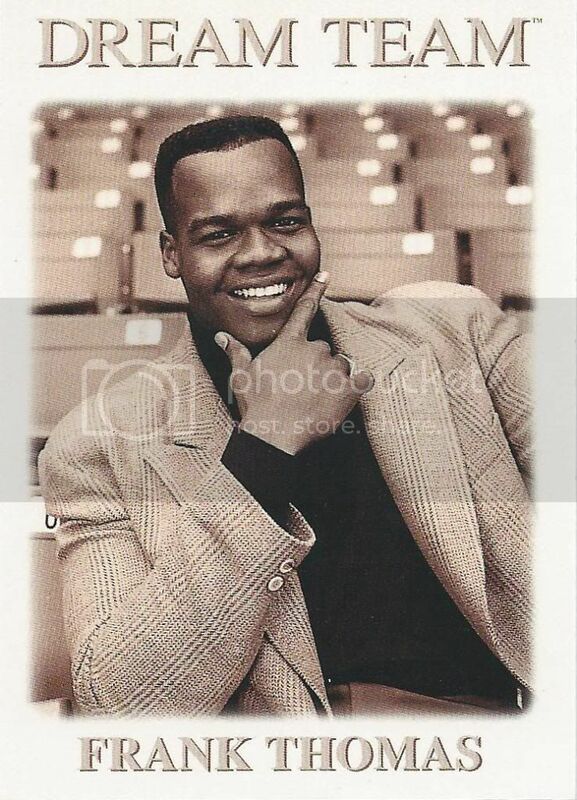 Why couldn’t my Senior yearbook photo look this cool? Oh, that’s right. Because I’m not cool. It’s kind of like a Crusades card without the dragons or the rabid fan base. 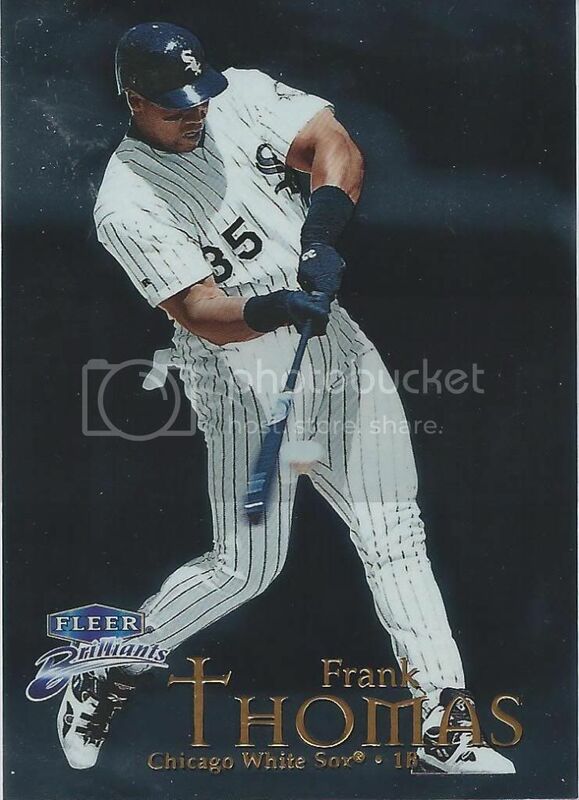 The back talks about how Frank was only the fifth person ever to have some crazy combination of high numbers for stats in several categories. It’s not worth repeating, because no one actually monitors that kind of thing. 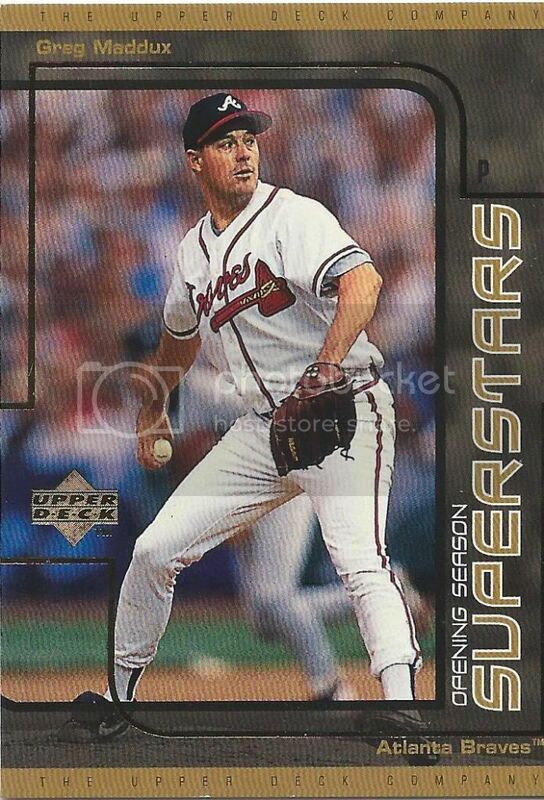 This is what dreams looked like in 1995. They were all lenticular and in fantastical fields with weird objects floating around you. And, after a couple generations of being in black & white, they were finally in color. 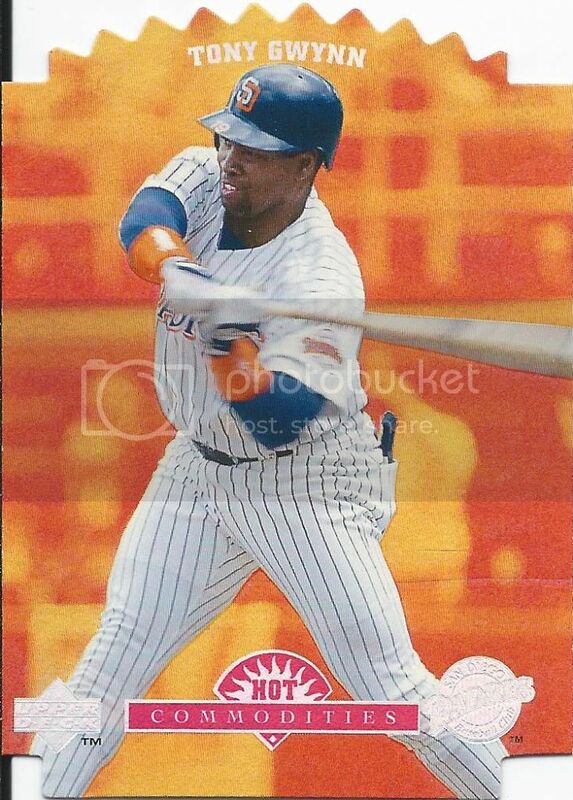 Not the only SQ insert set from this year, even. More StarQuest. Or should I say QsutEasrt? This here is the Double version. I bet you can’t guess how many versions there are, or which is the rarest. Easrt me, UD! Before there were coin and pin cards, there was SPx Finite with embedded fake gold pieces patting themselves on the back. And boy are they cool. 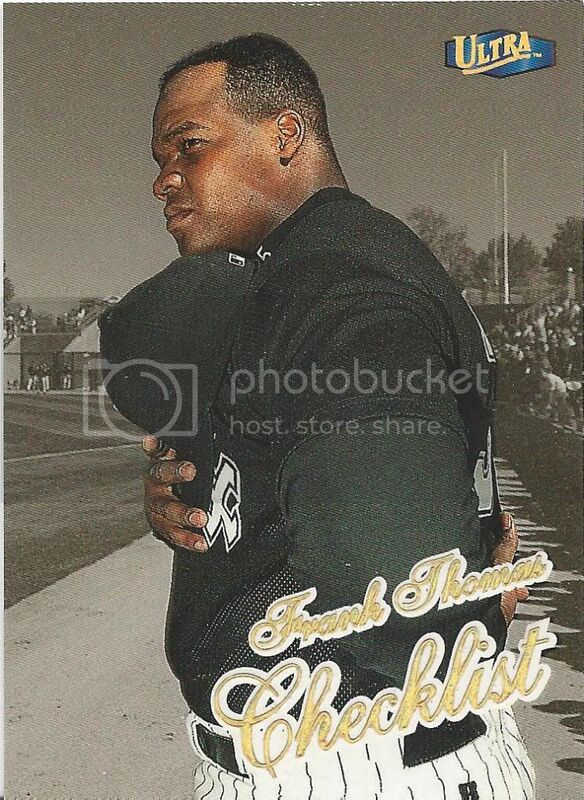 I’m not sure if every card in the set is numbered, but if my checklists are any indication, they are. This is the middle of three tiers of cards and clocks in at a production of 4500 cards. That’s just for this one. 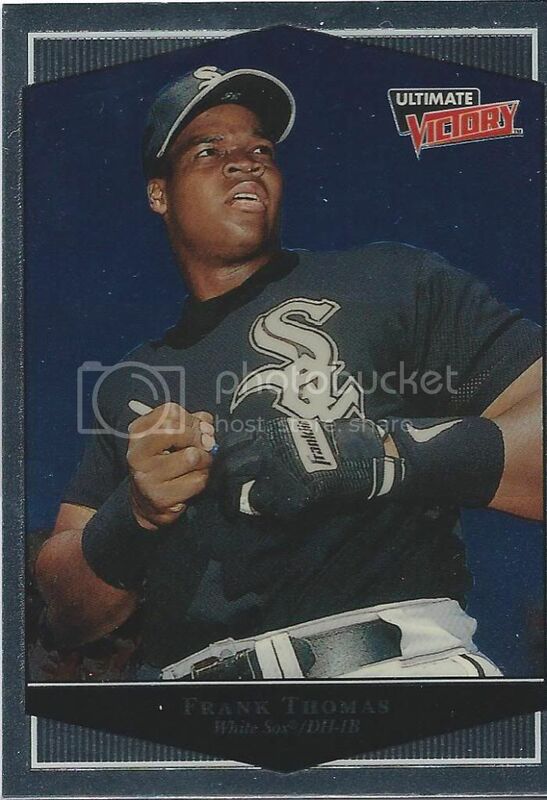 The Big Hurt is going to hurt my wallet with 5 more cards with three tiers to seek out. How’s this for a quirk. 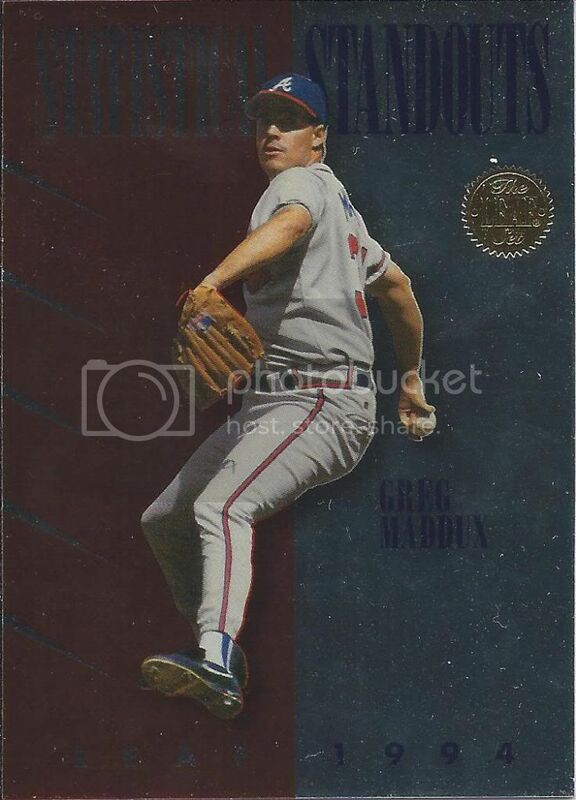 This is my second 1998 Ultra card. It’s a Gold Medallion parallel of a checklist. 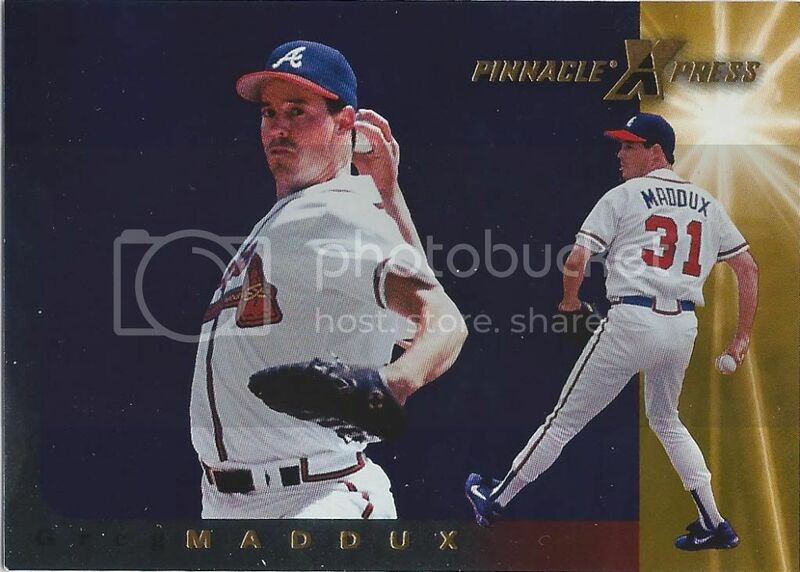 My first 1998 Ultra card was also a Gold Medallion parallel of a checklist. A different one. 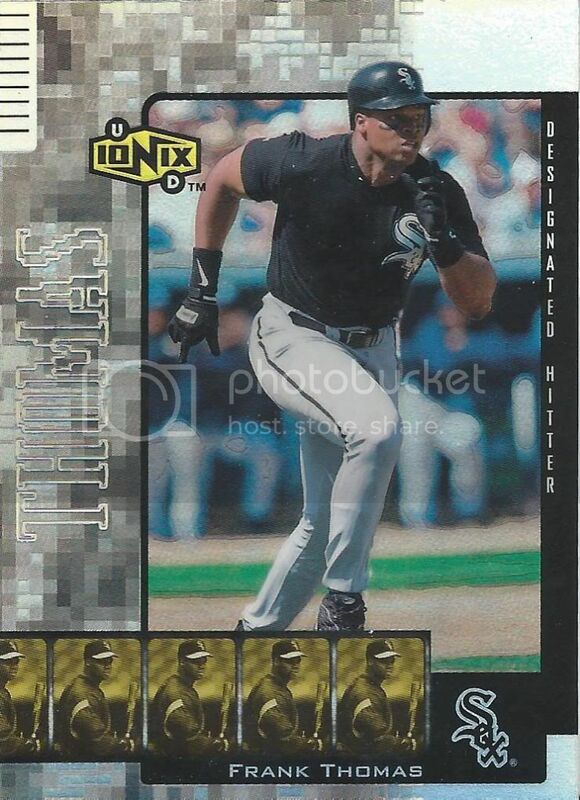 I’ve since added an insert from that year, but no non-gold Ultra set cards so far. Here’s another one of those Brilliants cards again. You’ll notice a repeating pattern with some of the cards. Excuse me if I run out of things to say at times. The skybox trail isn’t as prominent here since they’re using team colors. 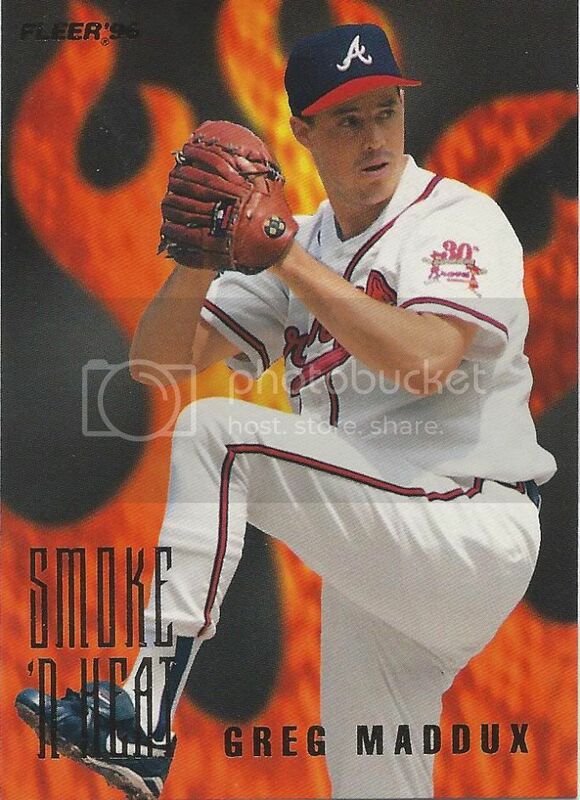 Instead it looks like half the card is engulfed in smoke. Which is better, actually. 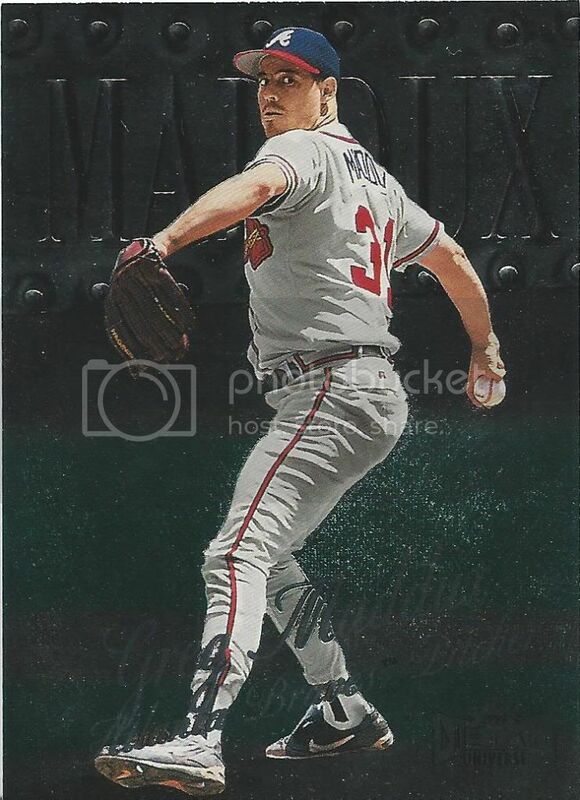 What can be said about this card that I didn’t say before? The boxes are weird? I don’t know. You're not going to sell this ball after I sign it, are you? Ultimate Victory is the reverse Opening Day. 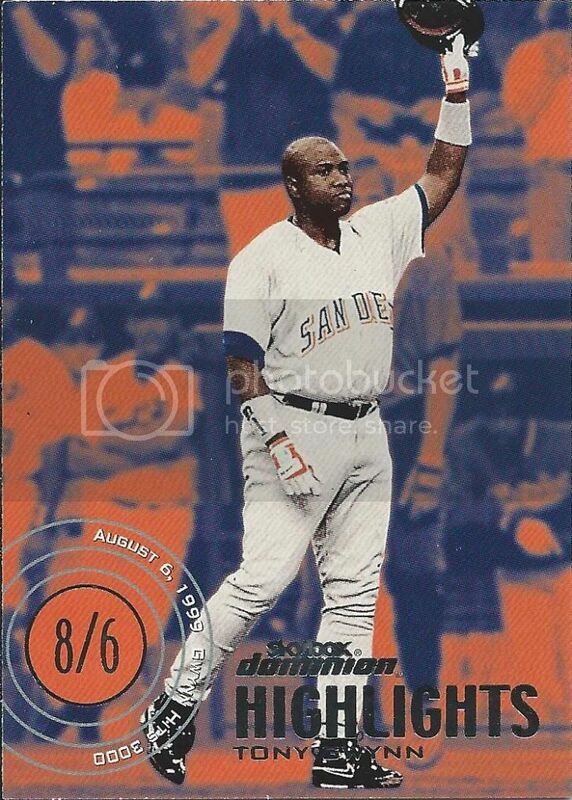 I guess you could call it the Topps Chrome version of Victory as well, but I like my first version better. Take a budget product, foil it up and slap the label “Ultimate” on it. Easy money. Yup. Grasskickers. It’s real. It was a thing. I’m a sucker for shiny objects. You all know this by now. The card companies certainly should know this. Ionix only lasted a couple years. 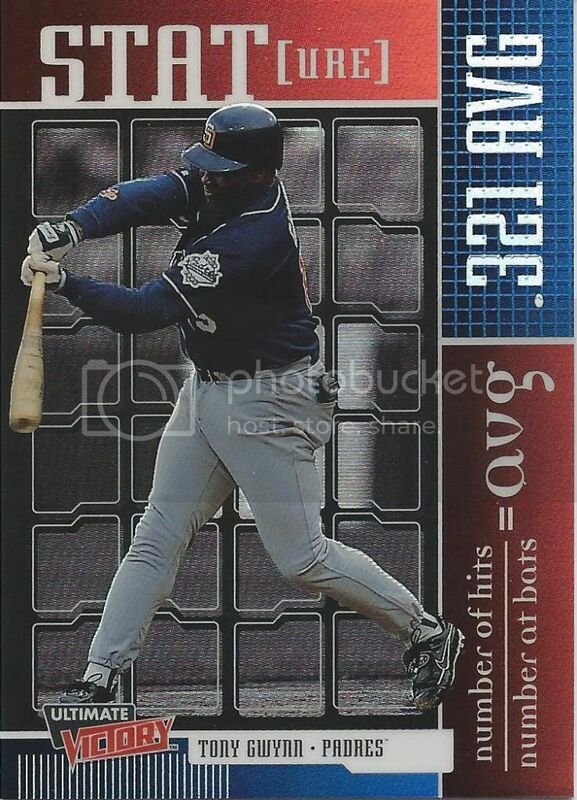 The big draw is in the really tough to find inserts and some of the Reciprocal parallels which were numbered in 1999. 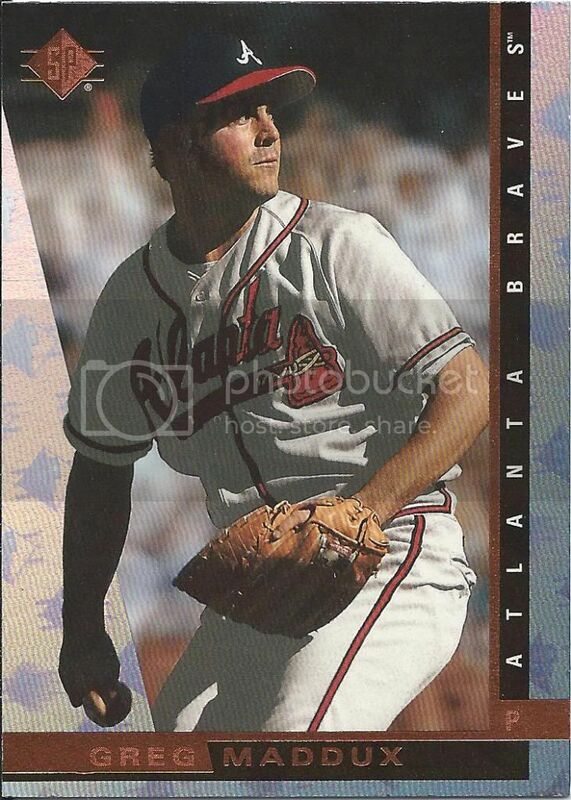 This 2000 card is not numbered, and my assumption is that it’s not as difficult to obtain. That certainly doesn’t mean I’m not happy to have it, though. 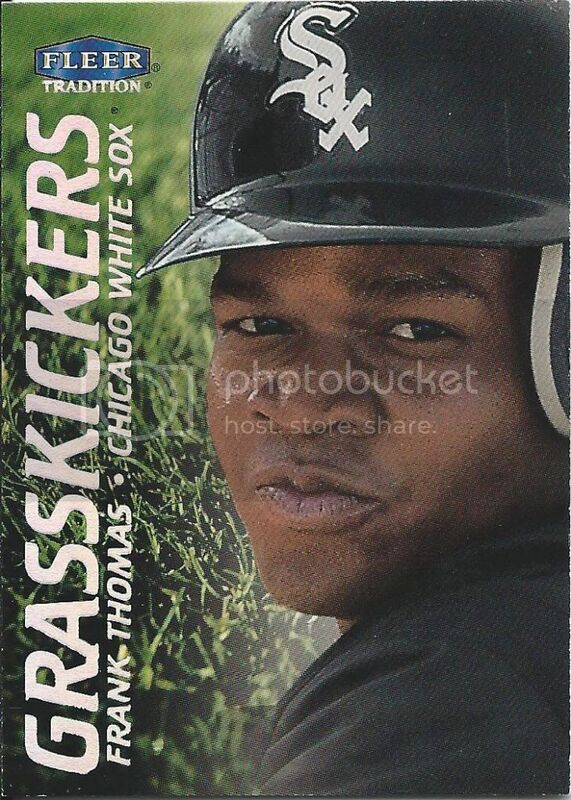 I have a feeling Topps Gold Label is going to haunt me for quite some time. Those different classes are so hard to distinguish and I have this little voice in my head that tells me I’ve seen that design before so I probably have it already completely disregarding the idea that there are 3 classes and not just one. Collecting is hard, guys. I like the red and silver more than the black and silver. His “stat” is also better. It’s all about 2-time consecutive Cy Young winners. 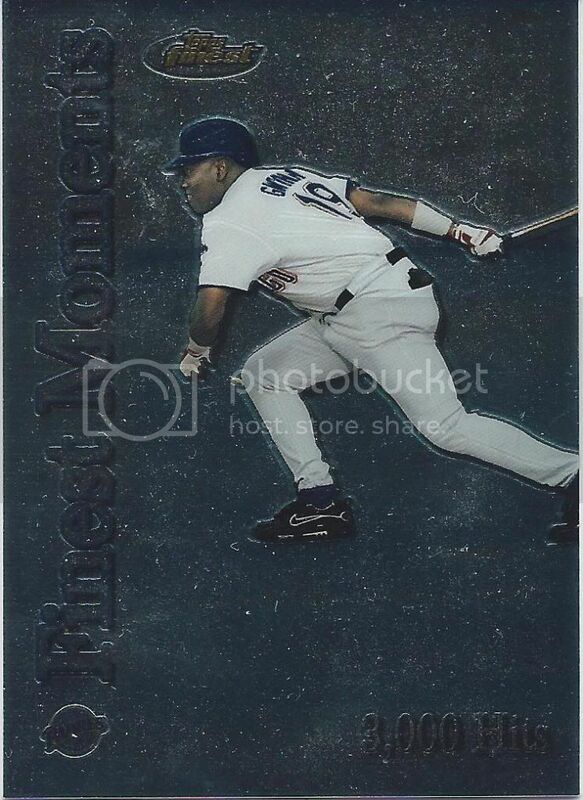 Have I mentioned how much I love mid-’90s Fleer inserts? Yeah. I have. This is no different. Do I really need to explain why? Imagine how cool this would be as a die-cut. You know, after the Past & Present basketball Fireworks I want this to be flashier. I want a little more heat to go with that smoke. We can all agree that Pinnacle X-Press is not a very good set, right? Maybe…THIS will change your mind. It’s the foiled up Men of Summer version. No? Still don’t like it? Oh well, I tried. Circle change or 2-finger FB? I'm terrible at this stuff. Ooooo….shiny holograms. Shiny is pretty. Holograms. Pretty. I don’t know why Metal Universe doesn’t get more love. I think they’re really cool. Some of them have some crazy stuff going on in the backgrounds, too, with mechanical spiders and robotic hellscapes and whatnot. Not this one. It’s just etched and textured like all get out. Happy St. Patrick’s Day! Thought I’d have this post up before that, but I didn’t. What does Opening Season mean? 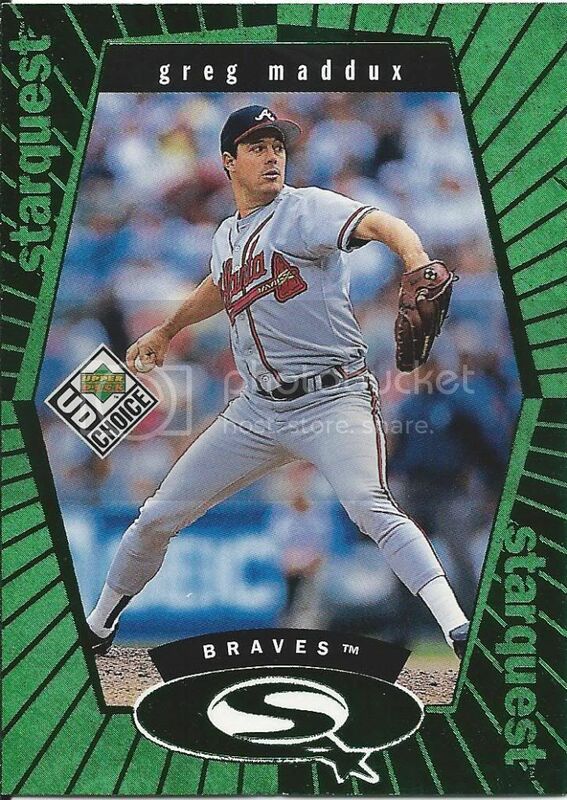 Some of these Upper Deck cards are tough to find in my checklist. They copyright date isn’t always the guide it should be. As you can see, it’s called Opening Season Superstars, but I found it under UD Choice Superstars. 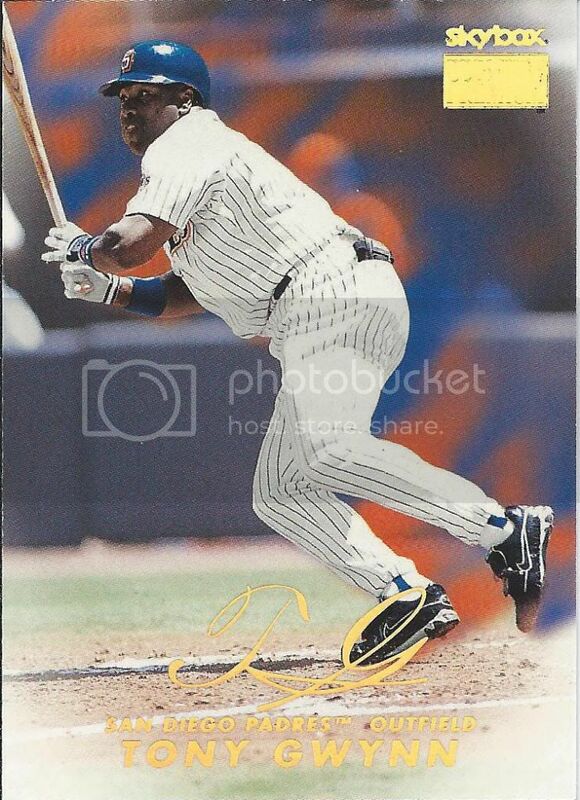 There’s no real indication on the front that this is from the Choice line instead of regular Upper Deck. Now I don’t have to worry about it at all anymore. I saved the last chronologically and alphabetically for last. I actually really like the Vanguard cards. 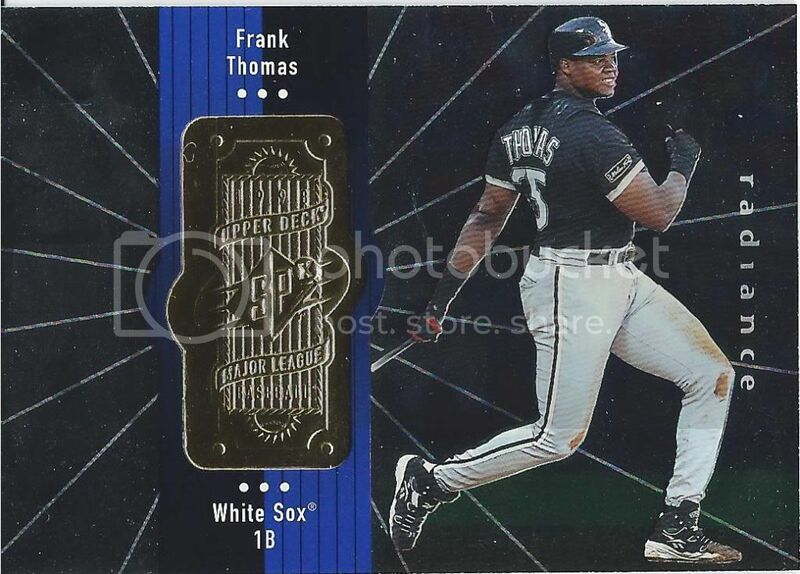 The Lichtenstein-like border gives the player that glow, but the shiny refractory foil board accentuates it. The thick card stock doesn’t hurt things either. Oh, and as for the “Record Breaking” part of the title. 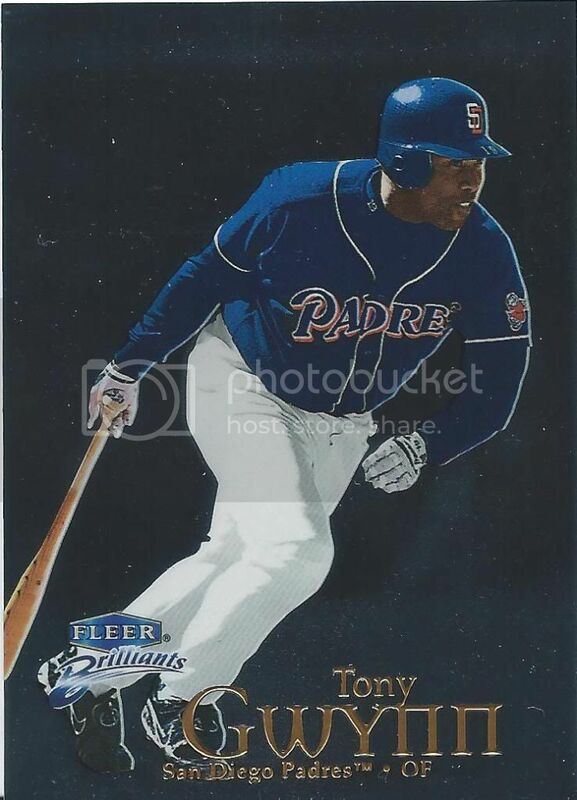 This trade got me over the 250 unique Tony Gwynn benchmark. 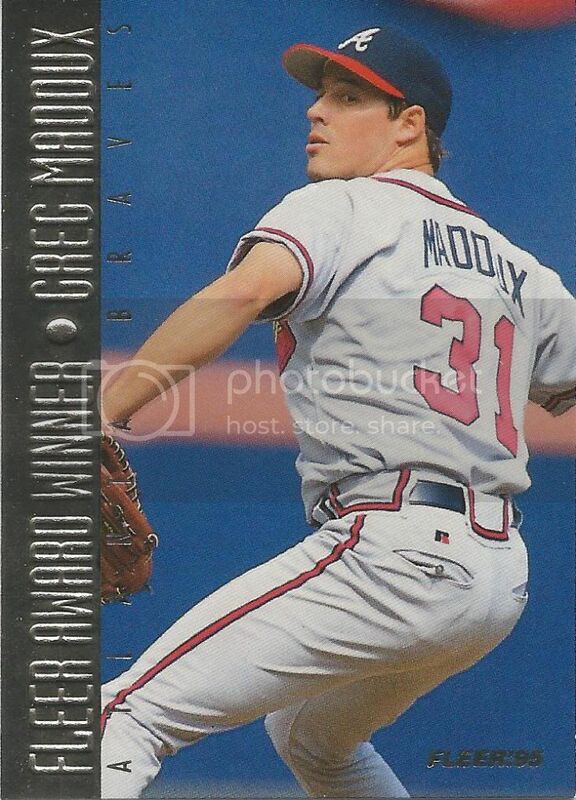 He also got me dangerously close to 400 Frank Thomas and 1,000 Greg Maddux. I’ve now since passed those thresholds thanks to other generous traders. But that’s for the another post. Thanks Chris for the great trade. One of these days I’m going to sit down and scour that massive want list of yours and help fill in more of those needs. I was partial to the Under Construction .gif, personally.